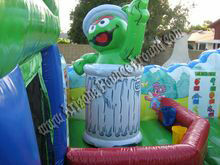 Rent a Sesame Street inflatable playland, perfect for childrens birthday parties. 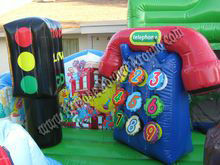 This inflatable features a small slide and lots of activities for kids inside. 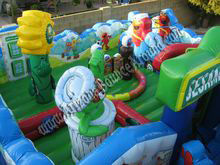 The Sesame Street Adventure Playland is a unique playground that offers fans of Sesame Street some educational playtime. 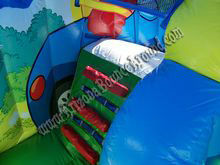 This inflatable obstacle course, designed for ages 3 to 5, offers counting and color activities, a large ball pond and an easy climb and slide for hours of aerobics and academic building fun! 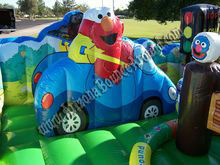 The archway leads children through to three-dimensional climbs, including Oscar the Grouch Can, Grover doors, Traffic Light, Elmo's Car Climb & Slide inside. Amazing 3-D flower and artwork surround the inflatable play structure inside and out, with depictions of the famous characters their favorite sidekicks.